Vehicle weight ratings, while incredibly important, can also be a confusing and difficult aspect of your motorhome to determine. Between GVW, GAW, GCW, and everything in between, figuring out how much your vehicle should weigh might seem like a bewildering serving of alphabet soup. For your benefit, we’ve compiled a list of the most important weight ratings to be aware of and how to calculate them for your own RV. 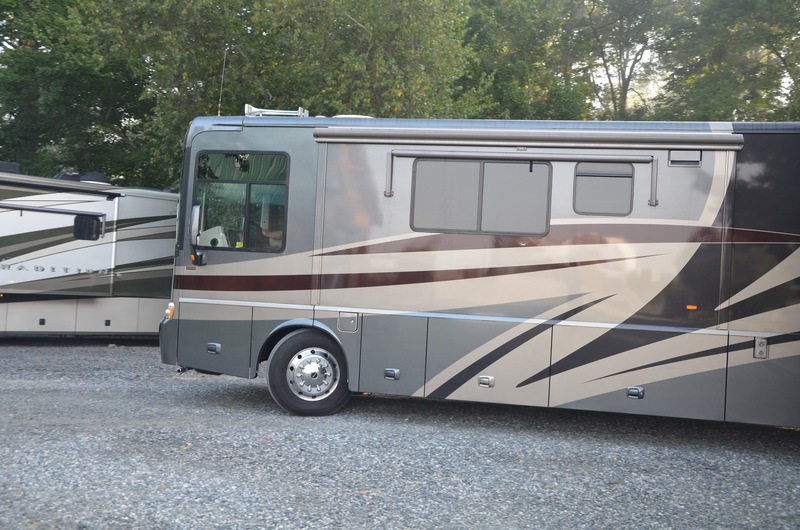 These numbers more or less refer to the overall mass of everything included in your rig for both motorhomes and fifth-wheel campers. The Gross Vehicle Weight (GVW) denotes the actual weight of your fully-loaded RV, which includes any cargo, water, additional equipment, and of course, passengers. This does not include your tow vehicle if you’re using a fifth-wheel, or any additional cars you may have in tow if you drive a motorhome. You can measure your GVW via a scale, such as those found at weigh-in stations for semis. Knowing your GVW is important, as you’ll want to be able to compare it to the limits determined by the manufacturer to avoid putting any harmful strain on the vehicle. This is also known as the Gross Vehicle Weight Rating (GVWR), which is the maximum weight your GVW should never exceed in order to keep your RV or tow vehicle safe and working properly. This rating should be found on a sticker affixed inside your vehicle upon purchase—usually you can find it in your RV’s kitchen cabinets. The Gross Combination Weight (GCW) is valid only if your rig has two parts: a tow vehicle and a towed vehicle. This not only applies to fifth-wheel campers attached to a truck, but also to motorhomes pulling an additional car. Your GCW includes the GVW of both your tow vehicle and your towed vehicle as previously calculated with cargo, fluids, equipment, and passengers. Your Gross Combination Weight Rating (GCWR) then is the maximum GVW that your tow and towed vehicles together should never exceed. These ratings, while slightly more difficult to measure, are also useful for several aspects of RV maintenance. The Gross Axle Weight (GAW) refers to the actual weight placed on a single axle. Although a well-balanced vehicle allows you to assume the GAW is balanced equally between both wheels on the axle, the GAW is different for all axles in the vehicle, with more weight generally supported by the rear. This number is particularly important when it comes to maintaining your vehicle’s tires, as the GAW must be within the tire weight ratings, as well as the Gross Axle Weight Rating (GAWR), which is the maximum amount a single axle should never exceed. Your vehicle’s GAW can be tricky to determine, but can be computed with the use of a scale. Begin by only placing the front wheels of the vehicle on the scale, which will give you the GAW for the front axle. You can then calculate the rear GAW by subtracting that number from your GVW for the loaded vehicle. By taking the time to familiarize yourself with your vehicle’s weight ratings, you can avoid putting unnecessary wear-and-tear on your RV and tow vehicle, which will help keep them running safely and efficiently. 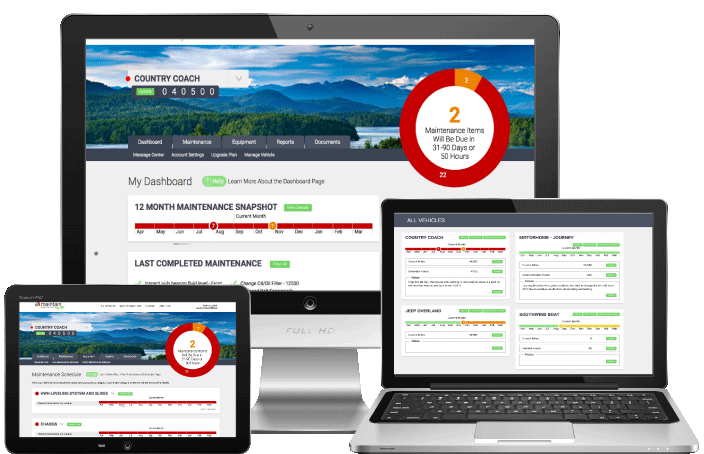 Be sure to use your online maintenance log at www.maintainmyrv.com to help remind you to keep up with this and all other aspects of your RV maintenance for the road ahead.